Years of plentiful rainfall have helped most regions, but a dry spring could signal the end of abundance. George Jones sang about "…some April, when all the land is wet…." That is, when the fabled "No-Show Jones" made it to his gigs to sing at all. This year, Jones was more reliable than the wet in April. It no-showed. We had become spoiled. Several good, rainy years in a row nourished the land and all the wildlife that lives upon it, and we forgot it might end. But what was that sound? Was it the rain screeching to a halt, or was it a screeching soprano signaling the finale of a fine performance? Or both? Macy Ledbetter, assistant manager of the James Daughtrey Wildlife Management Area, near Tilden, in South Texas, says, "It was too good to last forever. All good things must end. The party is over. The fat lady has sung." Throughout most of the state this year, rain failed to fall during April, one of the most critical months for wildlife in Texas. In fact, some areas have been getting dryer since the first of the year. When nature turns off the spigot, the moaning begins. The agony of past drought years returns. When it doesn't rain for a few days, people start asking if it's the first few days of the longest drought in history. Old-timers begin retelling the legendary, heartbreaking stories of the seven-year drought of the '50s, when the landscape shriveled up and cattle and critters died in droves. Bookstores start getting requests for Elmer Kelton's classic, The Time It Never Rained. It might be over. But even if it is, Texas is riding the crest of several good years in a row. I'm not sure the state has had this much rain over such a sustained period since Noah's famous float trip. There's a carryover from that blessed rain in habitat and inhabitants. There are still a lot of quail, and some areas last year had a 70 percent fawn crop (a percentage arrived at by dividing the number of fawns by the number of does observed in an area from August through October). The rainfall totals are down, but some moisture has continued to fall, albeit in lesser amounts. Ponds, streams and lakes still have ample water, and the sub-surface moisture is adequate. Weeds are high. At least we're not in a catch-up mode. Our land has been lush for almost three years, and wildlife reflects it. Had last year been dry and the winter harsh, it would be a different story. A dry spring following such a scenario, and facing an infamous Texas summer, would bode poorly for wild things. But that, thankfully, is not the case. The game is in perhaps the best condition it has been in during most hunters' recollections. So what if it is the bogeyman called drought? Will it kill us? Or maybe, just maybe, help us? Read on and see what the experts, the wildlife biologists of the Texas Parks and Wildlife Department, have to say. There is limited pheasant hunting in three Southeast Texas counties, but 37 Panhandle counties are open. Danny Swepston, TPWD district biologist in Canyon, says last season was better than expected, and there was a good carryover of Panhandle birds. Cover and moisture are adequate, so there should be another good season. Staff reports indicate increased numbers west of Lubbock, but a slight decrease to the east. For conservation purposes, prairie chickens may be hunted this year only on lands having an approved wildlife management plan. Gene Miller, technical guidance biologist in Canyon, though, says they are finding birds in unexpected places. Jay Roberson, TPWD's statewide dove program leader, believes harvest statistics from last season will show that hunters bagged fewer birds than predicted. Why? "Lower recruitment, because the above-average rainfall and cooler conditions may have lowered nest success," he says. So, if it does get dry, there could be a larger hatch this year. Around Brownwood, district biologist Kevin Mote says there are so many doves that wintered there that he's planning to buy shotgun shells by the case! In West Texas, Mike Hobson, district biologist in Alpine, says increasing numbers of white-winged doves will provide good hunting, as will Eurasian collared doves, which can be hunted year-round and don't count against your bag limit. Agricultural areas around Van Horn, Balmorhea, Midland-Odessa and El Paso are hot spots. In East Texas, Matt Wagner, technical guidance biologist in College Station, says doves are abundant around agriculture crops and seed-producing forbs in his area. Alan Cain, in Pleasanton, suggests dry weather will make water hole hunting more productive. Of course, it usually rains the week before the season starts and scatters the birds. Rick Taylor, in Uvalde, says the flights of doves there are "tremendous." It's looking good! Last year, the TPWD Outdoor Annual featured an article entitled "Prescription for Quail: Give ‘em Lots of Room and Then Just Add Water." Unfortunately, the reverse is equally true. Without rain, quail begin to evaporate. There are three quail species hunted in Texas — bobwhites (the most abundant), scaled (aka blue) and Gambel's. (Montezuma quail are found in West Texas, but do not have an open season.) They all need rain, although blues in the western third of the state and Gambel's in far West Texas obviously require less. Robert Perez, TPWD's chief quail biologist, sums up the situation like this: "Last season was out of this world in South Texas, probably the best in over a decade. There was adequate winter moisture and no prolonged freezing, so carryover was high. However it is essential that the region receive some spring rainfall to ensure green-up and maintain cover and insect crop." Ty Bartoskewitz, in Hebbronville, says spring conditions were "dismal," but in spite of that, numbers should be "average on managed properties." He saw a number of birds on nests by late spring. Evan McCoy, in Laredo, predicts another good season due to the strong carryover. On the coastal side of South Texas, Randy Fugate, in Falfurrias, reports "abundant brood stock having prime nesting and brooding conditions," but warns "this can change rapidly if we continue this dry trend." Farther north, technical guidance biologist Gary Homerstad, in Victoria, says the freak snowfall there added moisture without impacting quail. He tells of one covey "snowed in" after going to roost that flushed out from under it at noon the following day. He filed a subsequent report saying, "We got our May rain — up to three inches!" District biologist Bob Carroll in La Grange adds that "cloudy days and cooler temperatures at night should bode well for production." In North Central Texas, district biologist Kevin Mote says where it has rained on good habitat, the quail have prospered. The Rolling Plains should be Texas' second best quail hunting. Mote adds, "Feed the bird dog one more year!" Chip Ruthven, manager of the WMAs in the Panhandle, also predicts an above-average season for quail. There is an open season only on Rio Grande turkeys in the fall, not on Eastern turkeys. Most turkeys taken in the fall are shot by deer hunters. Spring turkey hunting, however, focuses exclusively on the magnificent Rio Grande. T. Wayne Schwertner, statewide turkey biologist, reports, "Over most of the state, we have had good rains for several consecutive years, giving us above average production. Fall turkey hunting should be excellent." David Synatzske says javelina numbers are at an all-time high after the last three rainy years. During public hunts on the Chaparral WMA last season, hunters shot 43 more than the previous record. Rick Taylor, though, warns that reproduction could decline if drought persists. They're everywhere! Hayden Haucke says hogs are profuse on the wildlife management areas (WMAs) he oversees in East Texas. David Synatzske reports that the population on the Chaparral WMA in South Texas is the highest in years. Hogs can be hunted year-round, and are fine eating. But they aren't hunted enough! No closed season; landowner permission required. Mike Hobson, in Alpine, draws from his staff's reports and says the improving habitat over the past three years enabled good fawn survival and recruitment. Seventy-one more permits were issued last year than in 2003. Expect more this year. There will be a substantial increase in adults in the herd, too, as the bucks mature. Danny Swepston, district biologist in Canyon, reports good habitat conditions in the Panhandle. The last snow there was the latest in the year since 1917, and added moisture to the soil. The Panhandle pronghorns should prosper, too. By permit only — Oct. 1 - 9. In the Panhandle, Swepston reports the habitat was in good shape during the spring. Chip Ruthven says the Matador WMA had a good fawn crop last year, good survival and the highest harvest in history. Expect a good year. Hobson points to the 30-40 inches of rain that some Trans-Pecos areas have received in the past 12 months (annual average is 7-18 inches): "The state of the forage and cover is such that drought effects will be minimized." Cover is imperative for fawn survival in a desert landscape. Mule deer numbers have risen steadily since 2000, and Hobson expects another increase this year — perhaps to an all-time high. I gave up my lease too soon. When you talk about deer hunting prospects, conditions vary widely in different regions of the state. Max Traweek, district biologist for the Hill Country, says overall, antler quality might be better due to the condition of the deer and habitat coming out of the winter. The eastern portion of the district toward I-35 may be in the best shape. Mike Krueger, technical guidance biologist in Lampasas, reports 44.8 inches of rain in 2004 — the most since he began keeping records. Twenty-one of it fell between October, 2004 and February, 2005. Good; I hunt nearby. Mike Reagan, another tech guidance biologist, in Wimberley, says the deer got an early jump on antlers there. But Donnie Frels, manager of the Kerr WMA, says April had the lowest rainfall on record, and he expects antler quality to be down. Farther north, Jim Dillard, in Wichita Falls, says that region is "rain challenged." Regardless, Kevin Mote, in Brownwood, says expect more, heavier deer with larger antlers! Whitetails are continuing to expand in the Trans-Pecos and the Panhandle. In East Texas, overall numbers seem about the same, but David Sierra says antler measurements and body weights in the Post Oak Savannah have risen steadily for 10-20 years. The harvest was down last season, so there may be more available bucks this year. Bob Carroll feels the six counties — roughly an oval shape from Brenham to Yoakum — will have improved quality bucks due to the experimental regulation that has been in effect. It expands to 15 more counties this season, possibly resulting in a lower buck harvest this year, but improved antlers in the future. Farther into South Texas, Bartoskewitz feels lack of spring rain will mean fewer trophies than last year. Ledbetter, though, says there will still be some super bucks, but agrees there will be fewer of them for the same reasons. Daniel Kunz, in Alice, says a drought could improve visibility and concentrate deer near feeders. Jimmy Rutledge cites recent research in Dimmit and Webb counties that indicates an abundance of cool season forbs is critical to above average antler development. He reminds us that above average rainfall early in 2005 provided that abundance. Trans-Pecos biologists estimate a bighorn sheep population at just over 400 animals. Last year, eight permits were issued — the most since restocking began! Another good lambing year is forecast. Hobson also says aoudad sheep, which may be hunted year-round, are also increasing. Call his office in Alpine for information. The number is (432) 837-2051. Hunting by permit and with landowner permission only. We're talking squirrels and rabbits here, for the most part. Rabbits are vegetarians, and the rainy years have fed them well. "There's one behind every bush," says Macy Ledbetter. I saw the same thing during spring turkey season. Homerstad lamented, "Sadly, there is not much interest in small game among our youth or adults. They don't know what they're missing. Rabbits and squirrels are plentiful and most likely will continue to be underutilized." David Sierra, district biologist in East Texas, points to the exceptional acorn crop. "Years of good mast production are typically followed by years of good squirrel production," he says. "The 2005 - 2006 season should be better than we have seen in the past couple of years," echoes Kevin Herriman, project leader for WMAs in Northeast Texas. Jeff Gunnels suggests hunting the Keechi Creek WMA, which he manages, and Gary Calkins reminds hunters of the thousands of acres of public hunting land available to holders of TPWD's Annual Public Hunting Permit. I have a couple of good recipes if you're interested, but not for jackrabbits. Prophesying success of the forthcoming waterfowl season is not like predicting how the quail crop is shaping up or the quality of deer antlers. Most of the nation's waterfowl spend the summer in the northern United States and in Canada. You can't just look outside in Texas and count baby ducks. Even if you could, the seasons and bag limits are strictly controlled by the U.S. Fish and Wildlife Service. The situation is further complicated by the fact that surveys in the north are often delayed by late blasts of ice and snow. According to TPWD Waterfowl Program Leader Dave Morrison and reports from USFWS, the prairies in Alberta and Western Saskatchewan were dry in May. But then the rains came. It may have been too late for early nesting birds, but should have made life easier for the late nesters. The U.S. prairie habitat was fair to poor, and birds returning there for the summer may have gone on to Canada. Combined pond counts for the U.S. and Canada, though, are up — 37 percent more than last year and 12 percent above the long-term average. That's good. Mallard numbers are down 9 percent from last year and 10 percent below the long-term average. Gadwalls are down about 16 percent, but that still puts them 30 percent better than the long-term average. Green-winged teal are down, but still up 16 percent over the long haul. The numbers of shovelers, a.k.a. spoonbills, are significantly higher than last year, and a whopping 67 percent more than average. Wigeons and blue-winged teal have also increased from last year. Scaup are at a record low population, but pintails have apparently increased since last season, though still 40 percent off the norm. Canvasbacks and redheads are unchanged from last year's data. Hunters need to be mindful that these latter two species may again have a shorter season within the season in each of the three duck zones. 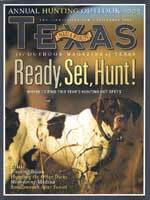 The Texas Waterfowl Digest, distributed at no charge by TPWD, contains regulations for all waterfowl species, and should be consulted before planning a hunt. The picture for goose hunters sounds promising. The "ice-out" came early this year, and that usually means good production. Morrison talked to a well-known Canadian biologist who reported that nest densities were as high as he had seen in years, and that the number of nests was up from past years. If the geese get enough to eat, there should be a lot of young, careless birds coming south along with the more prudent, mature ones that have heard shotguns before. White-fronted geese, commonly called speckled-bellies, continue to decline, and a shorter season is expected.